Austin Dean was “Star of the Week” for his Pre-K class, so he got to bring something to show and tell each day. 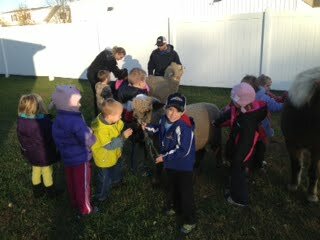 Of course he wanted to show off his sheep (and pony, too), and the school readily agreed on one request, they wanted the whole school (not just his class) to be allowed to participate. We obliged and took “Buzz” who is the friendliest white ram ever, and “Sally” his NC ewe who he proudly leads around himself at 4 years old. He also took a couple of their purple ribbons which he declared, “Are almost as tall as me!” It was a great experience and you could tell for so many of the children, this was their first close encounter with farm animals. There were lots of “Can we ride the big one” and “They are so soft.” We are so fortunate to have such a kid-friendly breed!